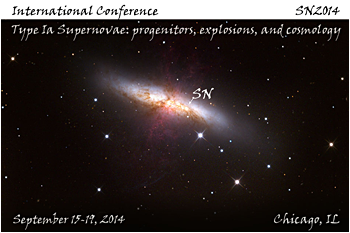 September 15 - 19, 2014 International conference: "Type Ia Supernovae: progenitors, explosions, and cosmology"
Organizers: Sarah Bridle, Scott Dodelson, Douglas Rudd, Elise Jennings, Alessandro Manzotti, Joe Zuntz. We are delighted that this meeting brings together such an enthusiastic group of scientists, and as a result we want to keep scheduled talks to a minimum, so we can all learn by doing, and so we can all shape the agenda according to the interests of the participants. The talks on the first morning will be a brief overview of the system, and in the afternoon we propose to quickly move to active coding sessions with the past-cosmosis developers in the room (we hope by the end of the meeting all the participants will be cosmosis developers!). The second morning will be in "unconference" format, where participants propose topics for small group discussion/talks/working, in real time. Finally we would like to finish the workshop by bringing together some of the work that was started and making a plan for how to keep helping each other to get more out of cosmosis. So do bring along your ideas for tools you would like to use, we're hoping you'll find cosmosis useful for writing your next (or current!) paper. 12:00 Reality check: What can we realistically finish this afternoon? Live from New York City and Oslo, this special webcast includes a tribute to Fred Kavli by Alan Alda, Brian Greene and Eric Kandel. Following a live transmission from Norway announcing the 2014 Kavli Prize Laureates, ABC News' Richard Besser discusses the announcements with Lord Martin Rees (Astrophysics), Ann Greybiel (Neuroscience) and Paul Weiss (nanoscience). 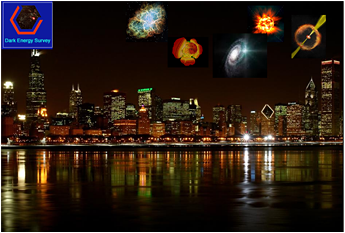 The Kavli Institute for Cosmological Physics (KICP) at the University of Chicago is hosting a workshop this summer on the origin of the non-thermal extragalactic backgrounds. The goal is to bring together observers and theorists representing all the high-energy wavebands and particles: radio, GeV and TeV gamma rays, and extragalactic cosmic rays and neutrinos. Topics will include isotropic diffuse intensity measurements, resolved extragalactic source populations and their collective contributions below the individual source detection threshold, anisotropies, and propagation effects and secondary cascades. * Is there a coherent scenario which explains all the current observations in terms of established extragalactic source populations? * What are the next steps (experimental + theoretical) to move past current uncertainties/degeneracies? We are planning a three-day workshop for about fifty participants convening on the campus of the University of Chicago. Each day will consist of plenary presentations with plenty of time for discussion in large and/or small groups. 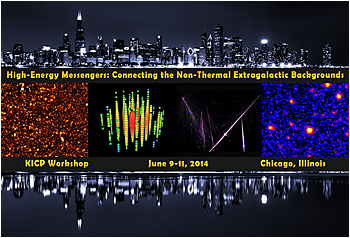 The Kavli Institute for Cosmological Physics (KICP) at the University of Chicago will host a Summer School on Education and Outreach from June 16 to June 27, 2014. This two-week summer school will immerse early career researchers in education and outreach (E&O) and allow them to gain experience and exposure to best practices by working with other scientists, E&O professionals, and museum staff on real projects. 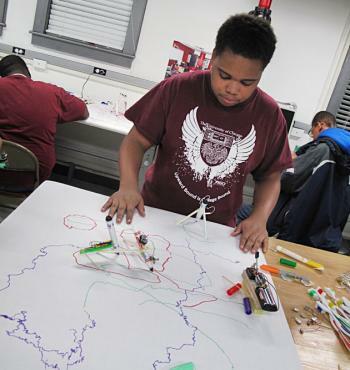 The core of the summer school will be a one-week practicum where students will be embedded in an existing E&O program and work with their mentors to develop K-12 lab activities, museum programming, visualizations, or a citizen science activity. The school will also provide a concise introduction to E&O basics through lectures and panel discussions on key topics (e.g., National Science Foundation, NSF, broader impacts), case studies of exemplary programs (e.g., the Brain Scoop), and field trips to Chicago area institutions including the Chicago Museum of Science & Industry (MSI), the Digital Media Lab/YOUmedia and the Adler Planetarium & Astronomy Museum. Because communication is central to effective E&O (and science), the school will kick-off with a special one-day science communication workshop presented by the Alan Alda Center for Communicating Science. The school will culminate with presentations by the participants on the results of their practicum experiences to their peers and a panel of E&O experts and faculty from the School of the Art Institute of Chicago (SAIC). Instructors: Louis Abramson, Andrew Belcher, Walter Glogowski, Chen He, Ross Cawthon, Randy Landsberg, Samuel Meehan, Kyle Story, and Kat Ziegler. 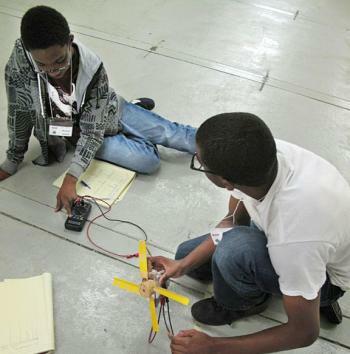 The 2014 KICP Yerkes Summer Institute explored different aspects of renewable energy. The "Biofuels: The Green Machine" lab investigated photosynthesis as well as producing biodiesel and ethanol. The "Catching Sunlight: Solar Cells" laboratory involved the students constructing solar cells that utilized berry juice and then testing the effects of lighting conditions on the electricity production of commercial photovoltaic cells. "A Wind Ensemble: Motors and Generators" explored the construction of horizontal axis wind turbines and Savonius turbines and then hydroelectric generators. Evenings were devoted to examining the night sky with the observatory telescopes and to a game of energy Jeopardy. The Kavli Institute for Cosmological Physics (KICP) at the University of Chicago is hosting a workshop this summer on inflationary theory. The goal is to gather a small group of researchers working in inflationary cosmology for several days of informal presentations and discussion relating to the status of theories of the inflationary universe. Topics of particular focus are model building, challenges for inflationary theories, connections to fundamental physics, and prospects for refining our understanding with future datasets. This meeting is a satellite conference of COSMO 2014. The meeting will be complementary to the COSMO conference in that it will be small, informal, and relatively narrow in scope. 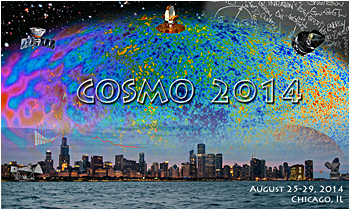 The Kavli Institute for Cosmological Physics (KICP) at the University of Chicago will host the International Conference on Particle Physics and Cosmology (COSMO 2014) on August 25-29, 2014, held at the University of Chicago's Gleacher Center. International conference: "Type Ia Supernovae: progenitors, explosions, and cosmology"
The Joint Institute for Nuclear Astrophysics (JINA), the Kavli Institute for Cosmological Physics (KICP), and the Flash Center for Computational Science at the University of Chicago will host an International conference on the observations and simulations of thermonuclear "Type Ia Supernovae: progenitors, explosions, and cosmology" on on September 15-19, 2014. 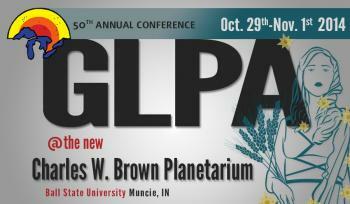 The conference will be held at the University of Chicago's Kersten Physics Teaching Center (KPTC). In our eighth short course KICP researchers will share the most current research about the cosmos focused on the theme of change and evolution. The course will feature a practicum, where teams of participants develop sky show presentations, which will be juried on the final day. Course Description The heavens fixed no more. Discoveries made over the past decade have revealed that the Universe and objects within are changing on timescales from shorter than a microsecond to longer than a billion years. From our own solar system and other planetary systems to stars, galaxies and clusters of galaxies astronomers are chronicling an evolving and evermore interesting universe with their sophisticated instruments. Though astronomers since antiquity have realized that new objects sometimes appear in the night sky, they considered the cosmos to be timeless and unchanging. Even as recently as the 1920s, astrophysicists had difficulty comprehending a universe that was not eternal. Now we know differently. Change is the rule. Planets form and orbit other stars; stars explode in violent supernovas; galaxies and black holes merge; and the Big Bang set it all in motion. Astronomers now regularly witness many of these phenomena -- fleets of space satellites and ground based telescopes monitor the sky in real time, detecting transient events like solar flares, gamma ray bursts and supernovae within hours. Telescopes in Antarctica are mapping the spacetime ripples from the Big Bang, the Universe's most dramatic period of evolution. These events let us observe new physics in extreme conditions which are only ever reproduced on Earth in massive computer simulations revealing how galaxies collide and stars explode. The goals of this workshop are to demystify the recent front page news about the detection of B-mode polarization in measurements of the cosmic microwave background (CMB) and to enable participants to craft a "science minute" presentation applicable to their home institution. A concise science overview talk will be followed by a break out session where teams will sketch out a "science minute" and then present their ideas to the other participants and the scientific experts. We will explore why the South Pole is the best place on earth for CMB observations, the different flavors of B-modes (or "swirls") encoded in the CMB's polarization, and the profound impact that these observations may have on our understanding of the Universe and inflation. Instructors: Julieta Aguilera, Walter Glogowski, Chen He, Randy Landsberg, Ian Remming, Ted Ressel, Richard Saldanha, Erik Shirokoff, Alanna Simone. The Yerkes Winter Institute (YWI) is a three-day residential science immersion experience held at the historic Yerkes Observatory in Williams Bay, Wisconsin. 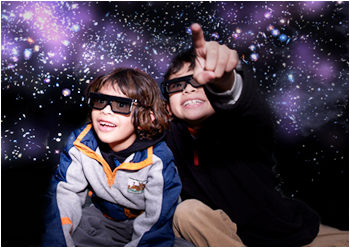 It offers high school students in the Space Explorers Program the chance to delve into STEM (Science Technology Engineering and Math) through experiments, nighttime telescope observing and by working side-by-side with practicing scientists. YWI 2014 continued the year-long theme of robotics, building on the fall quarter work on mechanics (e.g., levers and gears), and seeding the winter/spring quarter projects which will focus on programming and engineering challenges. The students cycled through three daytime labs in small groups devoting over three hours to each lab. Two labs utilized "Sphero", a small spherical commercial robot that can be programmed to move and display colors. One involved programming a Sphero to navigate a maze, while the other used them as a remote probe of surface variations, similar to how a robot might explore the surface of a distant planet. In the third lab the Space Explorers constructed simple insect-like bug-bots and engineered them to compete in a sprint and bot Sumo wrestling. Evening activities included observing with the Yerkes telescopes and two creative S.T.E.A.M (Science Technology Engineering ART and Math, or STEM + Art) projects. Both involved using technology to make art, the first with long camera exposures and Sphero's controllable lights and the other with bug-bots and more traditional media (i.e., pens and paper). Celestial art was examined with the 24-inch telescope, which was used to observe distant red giant stars and star clusters. In addition to OSP staff, there were nine instructors: three senior members of KICP, an Adler Planetarium & Astronomy Museum staff member, a postdoctoral fellow, a public school teacher, an artist, and two graduate students. The Yerkes Winter Institute is one of two annual residential science immersion experiences that the Space Explorers participate in - the 2015 Yerkes Summer Institute is scheduled for August 2-8, 2015.